Healthy by choice, not by chance! 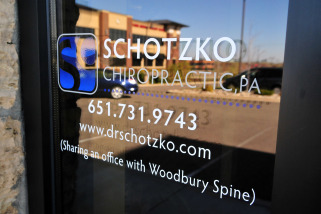 Schotzko Chiropractic is a Woodbury Chiropractor office specializing in safe and gentle chiropractic care for Woodbury and St. Paul areas. Do you recommend Schotzko Chiropractic? Our Woodbury chiropractor office is located in Woodbury, MN. We specialize in safe and gentle chiropractic care for all ages. We look forward to helping you feel your best! Your Schotzko Chiropractic reviews help others learn about this business nature. Best reviews about Schotzko Chiropractic are passionate and personal. They offer a rich narrative, a wealth of detail, and a helpful tips for other Schotzko Chiropractic customers. Please don't review Schotzko Chiropractic if you received a freebie for writing this review about Schotzko Chiropractic, or if you're connected in any way to the owner or employees of Schotzko Chiropractic.